aQrac is a comprehensive Investment & General accounting solution for individuals & small and medium enterprises. This software makes accounting of Shares, Derivatives - both Equity and Commodities, DP register, New issue, Rights issue, Buy back, Corporate action etc. very simple with minimum data entry. 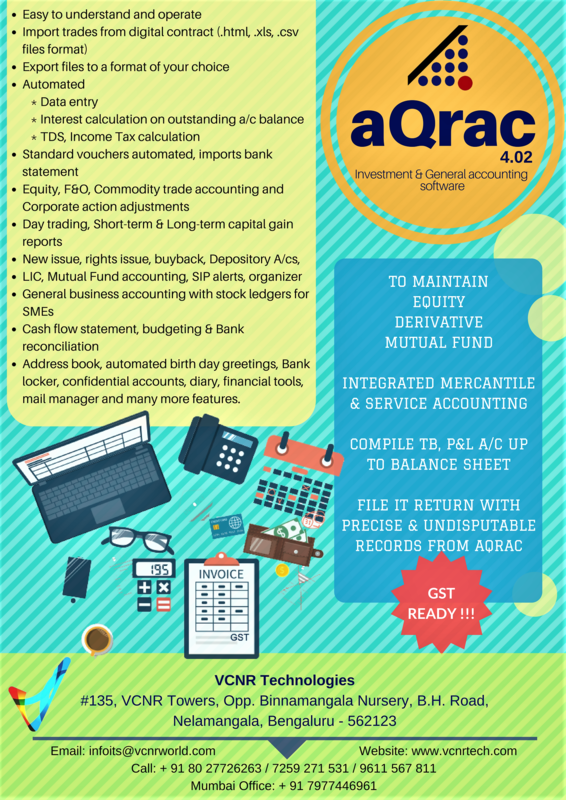 aQrac manages Mutual fund accounts, SIP, SWP alerts, computes Jobbing income, Short/Long term capital gains etc as per Income Tax requirements. Other investments like LIC, Post office deposits, Regular Income Bonds etc also could be managed with aQrac. 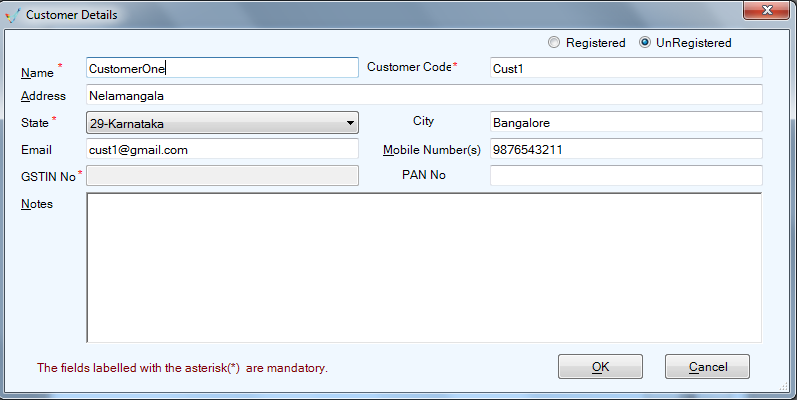 All regular receipts & payments are automatically accounted along with preparation of Income Tax certificates. It packs a complete general accounting package competing neck-to-neck with any general accounting package in the market today. Small businesses can easily migrate all their data from existing general accounting package with a single click. There is no configuration head-ache, no annual updation and annual subscription worries. Databases and new tax structures are updated silently without the need for user intervention. Of course any update can be reversed to the last stable point by the user any time. A complete accounting solution for Investment and General accounting. GST Tax calcualtions are being implemented. It’s a simple yet versatile billing software which is GST ready and makes invoice generation very easy. It comes with a rich set of features and can be downloaded from our website. Its free for one year. 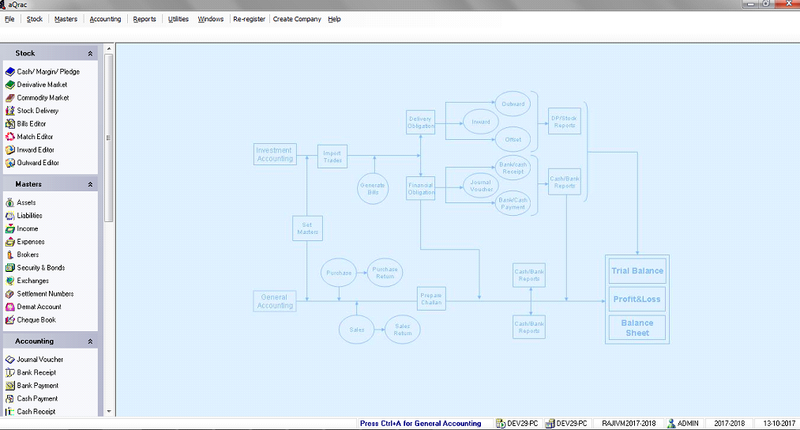 When you are ready, this software can connect to aQrac full software. Goods/products of purchase and sales are tracked by financial year. Data porting from existing systems. Import facility of Item/Goods/Products master. Reports can be printed in both GST Invoice format and also normal format. Export facility of the Invoices and the same to upload to GST server. GST Tax Returns file can be generated in .json format. Localization has been an add-on feature. Backup and restore database facility.